A webinar is an online presentation using special internet software. Participants can log in and hear the presenter’s voice, see the presentation slides and ask questions by typing in a chat box. The power of this tool is that the presenters, the organisers and the audience can be anywhere in the world. This allows voices from practitioners in the field to be heard and their ideas and experiences discussed and passed on. The recordings of the webinars provide a useful resource. Webinars were first used in RWSN in 2012, in a series organised by the World Bank, which drew on high quality papers and speakers from the 6th RWSN Forum in 2011. In 2014, webinars became a fully established part of how Skat Foundation encourages sharing and engagement between network members. On average 20 webinars are ran yearly, many in English, French and Spanish, on topics including manual drilling, rainwater harvesting, groundwater science, self-supply, water point mapping, and national monitoring. There has been experimentation with language; in a series on Manual Drilling, English and French were mingled into the same webinar presentation and question & answer. While this allowed the two language groups to come together, the feedback from the audience was that it would be better to do them separately. This was then done in the late 2014 series, which in some ways was more successful, though attendance of the French webinars was sometimes very low. While Skat will continue to innovate, a comfortable process has been established that enable series of weekly bi-lingual webinars running over 10 weeks. Of course, challenges remain, with sometimes unreliable internet connections and having to training new speakers every week. However, this in itself is having some impact as more and more people are being trained and given experience in presenting to a global audience and responding to questions. Improving communications skills across the rural water sector is essential for attracting support and success that can lead to better services for the rural poor. 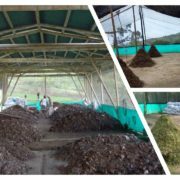 Organic waste management in Costa Rica. Msc. Victoria Rudin, ACEPESA, and Ing. Eida Arce, National Union of Local Governments of Costa Rica. Case study: Municipality of Alvarado, Costa Rica. Ing. Gabriela Gómez. Organic waste management in the Department of Valle, Colombia. PhD. Luis Fernando Marmolejo, PhD. University of the Valley, Colombia. Case Study: Municipality of Versalles. PhD. Ricardo Oviedo, Industrial University of Santander, Colombia.A total of 30 participants represented governmental institutions like the Ministry of Agriculture, the Ministry of Health, the Ministry of Environment and different municipalities of Costa Rica, as well as the Ministry of Environment of Ecuador and the University of Cuenca, among other. A total of 30 participants represented governmental institutions like the Ministry of Agriculture, the Ministry of Health, the Ministry of Environment and different municipalities of Costa Rica, as well as the Ministry of Environment of Ecuador and the University of Cuenca, among other. Since organics constitute between 50 and 70% of the municipal waste in Latin America, which are mostly disposed into landfills, there are still big challenges that require investments in infrastructure and regulations, as well as deep cultural changes towards source segregation. The systemic design of solutions and the experiences shared in the Webinar, offer elements of success that could be helpful to design and implement related projects in other contexts, enhancing empowerment of stakeholders and the sustainability of the strategies and policies. 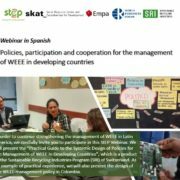 In this webinar, we present the Practical Guide to the Systemic Design of Policies for the Management of WEEE in Developing Countries, which is a product of the Sustainable Recycling Industries Program (SRI) of Switzerland. As an example of practical experience, we present the design of the WEEE management policy in Colombia. Renewable energy mini-grids are a widely discussed solution for cost-effective and reliable energy access. However, within the mini-grids dialogue micro and mini hydropower (MHP)1 is often overlooked, despite the large number of beneficial projects operating globally, particularly in rural regions of Asia, Africa, and Latin America. Webinar I: Why mini-grid technologies — PV, biomass, diesel, micro/mini hydro, wind, and hybrid systems — need to be differentiated. Often mini-grids based on different energy sources are simply lumped together when it comes to project and program design, calls for proposals, and in legal and regulatory frameworks. However, all mini-grids are not the same. This webinar highlights the important technical and non-technical features, as well as pros and cons of different technologies to create awareness on the need for differentiation of mini-grid systems. Webinar II: Grid interconnection of micro/mini hydro mini-grids: What happens when the national grid arrives? 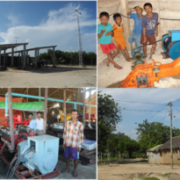 This second webinar in the series presents examples from Indonesia and Sri Lanka where micro and mini hydropower (MHP) systems have been successfully connected to the national grid and even benefited the local community. This third webinar in the series focuses on PEU of mini/micro hydropower systems. three examples of systems promoting productive end use in different countries such as Indonesia, Myanmar and Nepal. It will present pros and cons of electrifying “existing activities” versus “new businesses”.